The single-patty FM Burger at FM Kitchen. Photo by Phaedra Cook. Beer and burgers on a big patio sounds like a formula for success—as long as the burgers are really great. FM Kitchen and Bar, nestled over at 1112 Shepherd near Washington Avenue, nails all three parts of that formula. 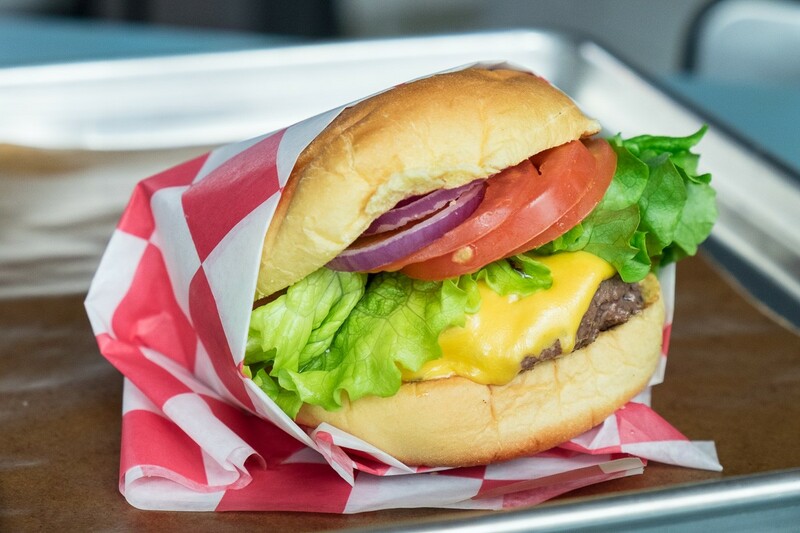 The house burger, aka the FM Burger, is one of those smallish but high-quality packages made popular by Shake Shack. By default, it comes with one patty for $5.89 and diners can add an additional one for $3.99. The “two-fer” package of two single-patty burgers is $11.89. It’s not a burger for those mainly seeking a bargain. It doesn’t come with fries or tater tots (add an order of those for $3.89) and pricing falls along the lines of Shake Shack as well. For those who value quality, though, the FM Burger is a must-try. The size looks small compared to some of the half-pound behemoths Houstonians are used to, yet for those who want to savor every crispy, creamy or salty component, it’s just right. The four-ounce patty, made from a proprietary blend of brisket, chuck and sirloin, has a dense, beefy flavor with touches of salt and pepper. The melted American cheese melds to the patty with the salty edge needed by the lettuce and onion. The tangy shhh sauce comprised of ketchup, mayo, mustard and pickles is great on the burger and diners might want extra on the side as well (more for the burger—and perhaps to dunk fries or tots in, too). A quiet, weekday afternoon inside of FM Kitchen. Photo by Phaedra Cook. Designed by Jim Herd of Collaborative Projects and decorated by Erin Hicks, FM Kitchen evokes the country charm of a roadside diner. 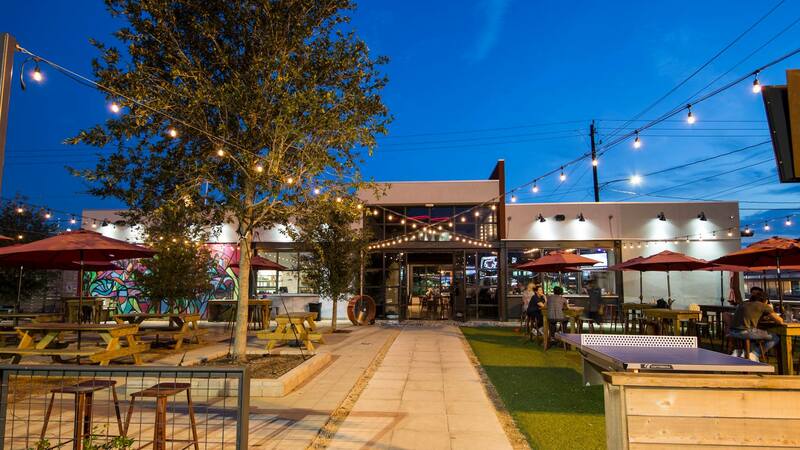 It features a dog-friendly patio, lounging areas and enough TVs (both indoors and out) to keep any sports fan in heaven. The menu from former Triniti chef Ryan Hildebrand offers a lot more than burgers, too. It covers a wide array of comfort Texas style dishes, including a righteous chicken fried steak and imaginative takes on classics like the FM Corn Dogs. The corn dogs are fried in fresh corn batter and served stick-less with a side of honey mustard that gets a small kick from dried chilies. An $8.99 order includes four. Yes, the corn dogs cost more than a burger. Again, quality is the reason. They’re made with locally sourced, all-beef hot dogs framed by perfectly crispy on the outside, fluffy on the inside, slightly sweet cornbread. Each bite mixes the cornbread with salty, meaty juices, creating savory contrast to the honey mustard dipping sauce. FM Kitchen and Bar’s Patio at dusk. Photo courtesy of FM Kitchen & Bar. Moving over to the “Salads X Soups” section of the menu, FM offers gumbo in two sizes: the $5.89 cup and the $13.49 bowl. While andouille sausage, shrimp and crawfish give the gumbo a decently spicy undertone, an overuse of tomatoes took away from the overall richness of the dish. The end result was a stock that seemed more tomato-based than a traditional roux. Rounding out the shareable plates is the spinach and artichoke dip for $9.89. This generous bowl is filled almost to the brim with a decadent, creamy mixture of jack and cream cheeses and topped with a hefty amount of onion and garlic. This is a very rich and savory dip that is thick enough to eat with a spoon, but not so heavy that it breaks the chips—essential qualities for any good dip. Even though the artichokes soak up a fair share of the cheese blend as well as the onion and garlic seasonings, there’s still enough of the original acidity and texture to keep the dish from being too heavy or milky. Larger plates at FM Kitchen include Pan Roasted Chicken and get-them-before-they-sell-out Half Racks of Smoked Pork Ribs, as well as the Texas Pot Pie, where brisket is the main feature instead of chicken. The pot pie is served piping hot and it’s very large, so come hungry or be ready to share. It’s best to cut a small hole in the crust to allow some of the steam to escape before digging in. The hole also allows for a glorious, smoky, meaty aroma to billow out of the puffed pastry. Inside is a rich, hearty, still-simmering blend of smoked brisket with cooked carrots, mushrooms, onions and peas, all floating in a barbecue gravy. It’s a fork-and-spoon dish, but don’t forget the cheddar cheese pastry. It’s worth every flaky bite and great for dipping into and soaking up the brisket-filled gravy. The FM Old Fashioned. Photo courtesy of FM Kitchen & Bar. As every good meal deserves a good drink, FM has over 20 beers each on bottle and tap. Draft beers feature local brewers like Town In City Brewing Co. and Eureka Brewery, as well as out-of-town favorites like Lone Pint’s Yellow Rose. On the cocktail list, FM offers four house cocktails and two “Tap-Tails” (cocktails on tap): the FM Margarita and the Watermelon Mule. 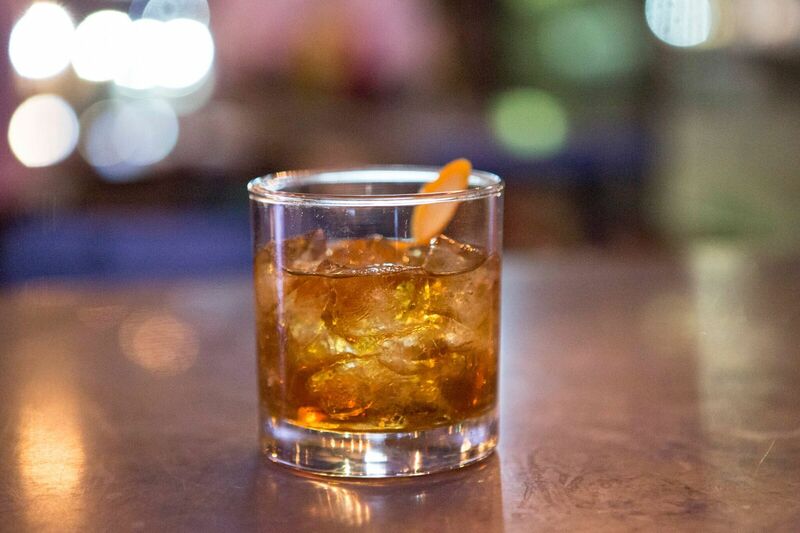 The FM Old Fashioned is slightly sweeter than traditional old fashioneds thanks to apple-infused whiskey, but walnut and vanilla bitters counterbalance and round out the flavors. It’s served with an orange peel but those wanting a little more tartness can ask for an orange slice from the bar instead. All of FM’s dinner cocktails are $8 each. Breakfast cocktails (breakfast runs every Sunday from 11 a.m. to 3 p.m.) are $5 each. Wine lovers don’t get as much affection on the menu, especially red drinkers, but most of FM Kitchen’s clientele are probably quite content with beer and cocktails. When it comes to sweets, there are luxurious milkshakes in vanilla, chocolate, strawberry, banana split and peanut butter and jelly for $8.89 each. In addition to these whipped jars of sugary indulgence, Hildebrand and team frequently offer a specialty, off-menu shake like the peanut butter banana milkshake with bacon crumbles offered for a recent Sunday breakfast. Anyone looking for a good time, on a good patio, with some really good food, could do far worse than pay FM Kitchen a visit. 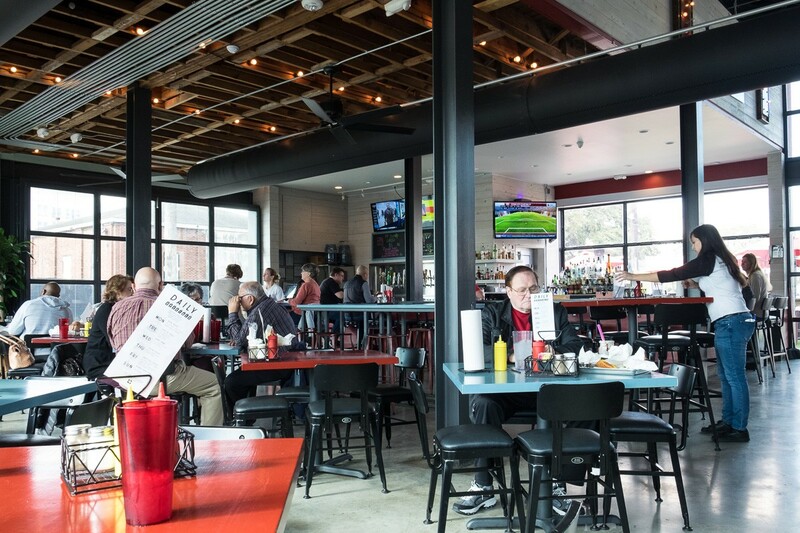 FM Kitchen and Bar is located at 1112 Shepherd and open from 11 a.m. to 10 p.m. Thursdays through Sundays and 11 a.m. to midnight Fridays and Saturdays. All costs for this review were paid for by the writer and/or Houston Food Finder.